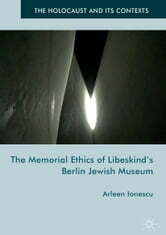 This book is a detailed critical study of Libeskind’s Berlin Jewish Museum in its historical, architectural and philosophical context. Emphasizing how the Holocaust changed our perception of history, memory, witnessing and representation, it develops the notion of ‘memorial ethics’ to explore the Museum’s difference from more conventional post-World War Two commemorative sites. The main focus is on the Museum as an experience of the materiality of trauma which engages the visitor in a performative duty to remember. Arleen Ionescu builds on Levinas’s idea of ‘ethics as optics’ to show how Libeskind’s Museum becomes a testimony to the unpresentable Other. Ionescu also extends the Museum’s experiential dimension by proposing her own subjective walk through Libeskind’s space reimagined as a ‘literary museum’. Featuring reflections on texts by Beckett, Celan, Derrida, Kafka, Blanchot, Wiesel and Selma Meerbaum-Eisinger (Celan’s cousin), this virtual tour concludes with a brief account of Libeskind’s analogous ‘healing project’ for Ground Zero.